J.T. 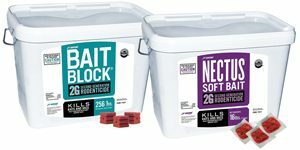 Eaton introduces two new second-generation baits: Bait Block 2G (#716B) anticoagulant rodenticide’s multiple-edge wax blocks are made of palatable ingredients to make them attractive to rodents, and are specially formulated to resist humid conditions and mold. Nectus 2G Soft Bait (#716S) is made of oil-scented compounds. The single-feed bait is especially suited for rodents that are reluctant to take other baits, and for places where there is a source of competing food. Its moisture content makes it ideal for use indoors, where water is not as available to rodents. Both products feature .005 bromadiolone as their active ingredient and contain Bitrex to deter consumption by children and other non-targets.